Eberhard & Co is one of the traditional Swiss watchmaking companies, established in 1887, in the heart of the Watch Valley, in La Chaux-de-Fonds. In the early beginnings of the 20th century, Eberhard & Co became one of the largest watch manufactures in Europe, specializing in production of technical watches and chronographs. From the late 1930’s, the company even supplied military chronographs to the Italian Royal Navy’s officers. Following WW2, the company extended its range to include its first ladies model, while, more recently, it focuses on oversized luxury watches. In 2014, Eberhard & Co renews its partnership with the Ambrì Piotta Hockey Club, which is a Swiss professional ice hockey club, also known as “Bianco-Blu”. The nickname can be translated as “White and blues,” and it refers to the club’s emblematic colors. 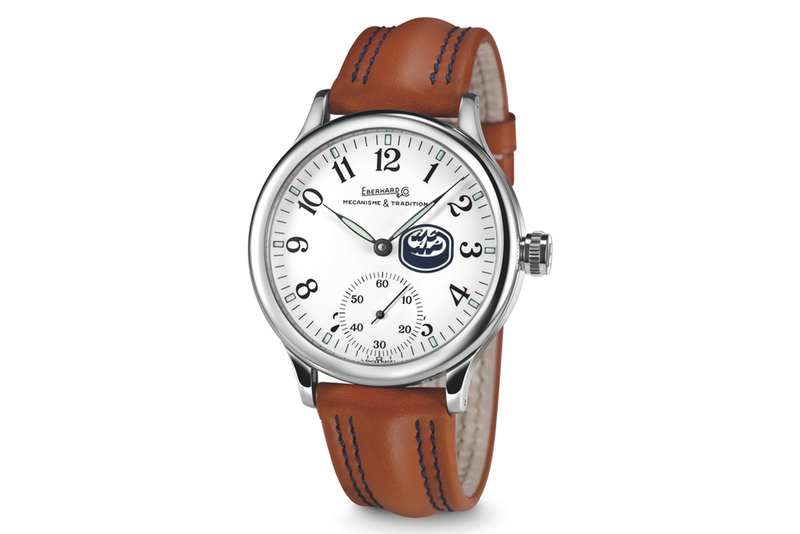 For this special occasion, Eberhard & Co presents a limited edition of its Traversetolo “time-only” model. The watch is issued in only 77 exemples, as many as the Ambrì Piotta Hockey Club years. Eberhard & Co Traversetolo model was introduced in 1996, when the brand shifted its focus to large-sized models. Traversetolo, which is also available in chronograph version, is distinguished by its 43-milimeters diameter, and its large mechanical hand-wound movement. The caliber UNITAS/ETA 6498 is based on the historical mechanism dating from the 1950’s, which has been improved and perfected over many decades. In addition to hours and minutes, the mechanism also powers the continuous small second indicator at 6 o’clock position. This Swiss-made movement beats at a frequency of 18,000 vibrations per hour, and provides about 45-hour power reserve. Thanks to the special sealing, the caliber is protected against the ingress of water to up to 50 meters. Eberhard & Co Ambrì Piotta Limited Edition is crafted from stainless steel. The watch emanates a distinctive vintage vibe, which reflects in its understated design and its clear watch face. The case is nicely rounded and polished to embrace the plain white dial with large Arabic numerals and leaf-shaped hands coated with luminous material. An instantly recognizable Ambrì Piotta insignia appears in its traditional shade of blue, at the 3 o’clock position, while the outer perimeter of the dial hosts 12 luminescent dots, serving as time-markers. The Ambrì Piotta Limited Edition Traversetolo (reference number 21016) is mounted on a brown leather strap with blue contrast stitching. The watch is fastened to the wrist with a stainless steel buckle adorned with the E&C logo. This special edition is available for purchase via the Ambrì Piotta website, and it retails for € 2,000.